I got this baby day before. 🙂 And am so glad to have got this one. Of course this is like taking a step back ward from digital world to a filmroll based one, but it has a real vintage feel to it.. and so far, as one of my very good friend says, it DOES give me a high, a kick of sorts while I click away the photographs! This is a time for another beginning.. and I shall be letting you know that asap! Winks. Keep reading. No, I’m not going to whine about getting one just like that. No. Is that a SLR? i am sure its one, coz i recently saw one owned by a professional. 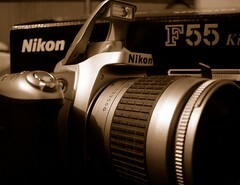 the same nikkon !! !